Having sent back the cow and the calf, we were left with an empty cowshed. We had built this cowshed to protect the cow from predating leopards. It was July-August 1988. The Kanchi Shankaracharya had laid the foundation stone for our proposed hospital at Kenchanahalli. During his visit, he had remarked looking at all the little children gathered there, that we needed to do something for them. As I was wondering what to do with the empty cowshed, I remembered what the Shankaracharya had told me and the idea of the school came up. I felt that it would be good to get all the children together, keep them engaged for at least half a day and then give them a good meal. That was the objective at that time, though it was easier said than done. Finding the children was easy. We found 28 children – our first batch, as they later came to be known as. 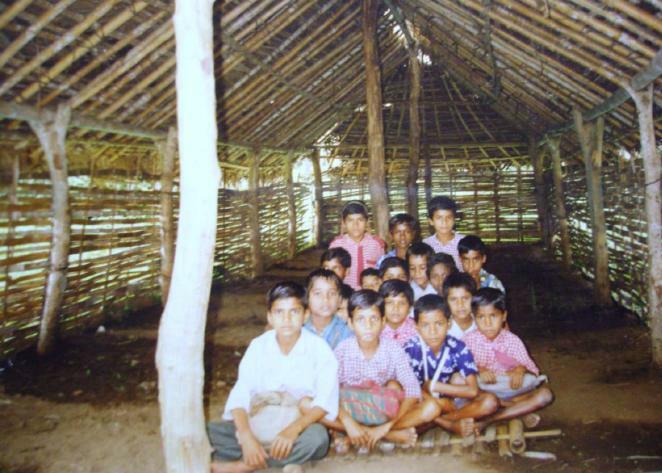 24 were from Brahmagiri & Elachikatte hadi, 2 from Rajapura, 1 from Sanimadana hadi and 1 from Hosahalli. They were all in the age group 6 to 9 years. The first few days saw me teaching them. I soon realized that literacy was the farthest from their minds. I also neither knew how to or what to teach. I chose the easier option of deciding that we will have fun for half a day – play, learn something and spend the time cooking the afternoon meal. These were some of my best times. This first batch of 28 become emotionally very close to me. Even today, we hold a special place for each other in our hearts. We now had a place and a part time teacher in me and cooks in all our little children. I especially remember Kamala for the excellent sambar that she could make and Sundari for the meticulous way in which she prepared the Ragi balls. The pressure of other tasks was making me play truant as a teacher. I found that the children sometimes enjoyed my absence more than my presence. It was indeed a great learning experience for me to slowly understand how learning happens, what needs to be the learning environment, the different tools and methods that we could use, etc. My foundations of pedagogy and education – content, transaction methods, curriculum and class room management were built on this experiential platform. The school – much later! I knew that I had to find an alternative for me. A few weeks before, Lalitha, a Bettakuruba lady had moved into Brahmagiri from Kodagu. She had just separated from her husband and had a baby. She needed some support and had studied till the 9th standard. She became our first teacher. Now that we had a class room (our famous cowshed with cow dung flooring), a teacher and a bunch of students, we needed some books, clothes and a blackboard to make the school complete. Swami Sureshananda helped by getting us these items and we were ready! We decided to call our school Viveka – Center for Learning. It was much later, on the suggestion of Shri M.R.Srinivasa Murthy, the then Chief Secretary of the Mysore Zilla Parishad that we added the word ‘Tribal’ to the school’s name.